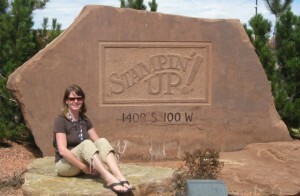 Hi and welcome – I’m Sarah Wills, an Independent Stampin’ Up! Demonstrator and I LOVE what I do! I am very happily married and have two girls, two cats and in the not too distant future, we are planning on having some chickens running around to add to the chaos! When I’m not stamping, I am shuttling my girls to and from school & their various activities, trying to maintain the house and work on growing veggies in our recently built vegetable garden – along with trying to tame some of the wild back yard, but that is a never-ending process! I became a Demonstrator in October 2007 – in fact just as soon as I could – the day after I received my social security number, I joined! 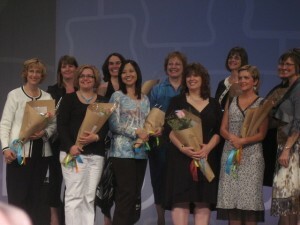 I loved it so much that I began to build up my business and in 2009 earned the #2 Rising Star Award – wow was I shocked! And with it came a trip to Founders Circle with the top 100 US Demonstrators and what an experience that was…it made such an impression on me that I vowed to work hard to get back there – and that I did – another 5 times! But the best bits about earning Rising Star were the lasting friendships that formed from that first Founders Circle trip – I met my wonderful stamping friends Kay Kalthoff and Sharon McNeely – and here we are on Awards Night that year – all in shock and stunned! It has also enabled me to travel to exciting places and be thoroughly pampered – so far I have achieved 6 Founders Circle trips to beautiful southern Utah (2009, 2011, 2012, 2013, 2014 & 2015) and 5 FREE incentive trips for myself & hubby with Stampin’ Up! – our next trip is to Alaska in July 2018! With each order you place in my online store I will mail you a thank you card that uses new products along with a sample or two – and during the month prior to a new catalog release, I mail out to all customers who have ordered with during the last year an envelope containing some samples of some of the new products, including the new In Colors for the annual Catalog release. My customers have their orders delivered right to their door direct from Stampin’ Up! and receive all of the hostess and promotional benefits that they are entitled to. They also receive very prompt service – I pride myself on customer service and providing fast response to emails. I use my blog to showcase products that I make and you can subscribe to receive all my blog posts in your email using the button to the right – you will also see a button to my customer mailing list to receive my Newsletter too. Additionally you can find me on social media – please use the buttons on the top right of my side bar to follow me – thank you! If you do not have a demonstrator and would like a copy of the current Stampin’ Up! Catalogs, please contact me and I will be very happy to get them into the mail to you. I would love to have you become one of my customers or a member of my team – the Ink Spot Stampers – if you have any questions please contact me and I will be very happy to help. Sarah, your updated website is so user friendly what a great job you and your husbands teamwork accomplished. Mostly I love the menu go directly to the area you wish. Awesome ! love you blog I now have you to follow. Its not often you get tutorials to download from other demonstrators so I love that. I have a great demonstrator here in CT, but I always look for other ideas.